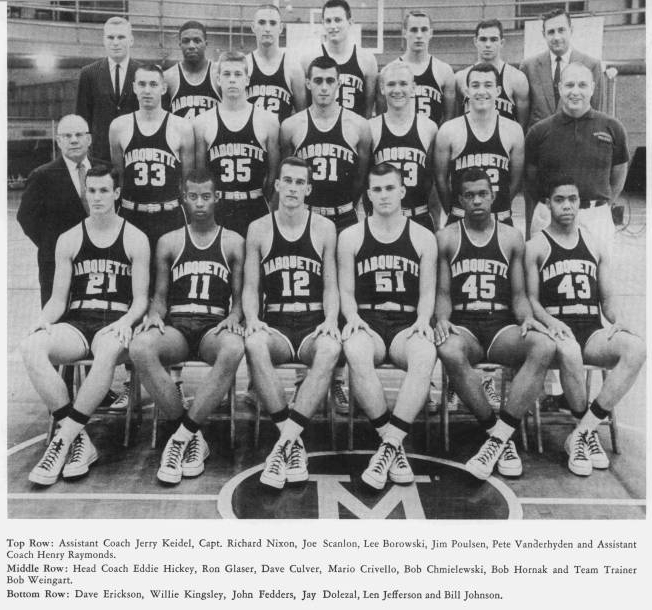 The Marquette basketball team completed the 1961-62 season with a 15-11 record. The Warriors were 9-4 at the halfway mark, lost 4 in a row, then finished by winning six of the last nine. At the Milwaukee Arena, Marquette won 11 and lost 3; on the road they won 4 and lost 8. Ron Glaser was the leading scorer totaling 426 points for a 16.4 average. Following Glaser were Bob Hornak with 14.5, Dave Erickson with 12.6, Richard Nixon with 10.6, and Len Jefferson with 8.0 points per game. Rebound leaders were Erickson with 211, and Hornak with 204. Single game season highs were recorded by Glaser in points (30, against DePaul) and by Hornak in rebounds (18, against Kansas State).